In today’s urban setting, stainless steel has a high demand for construction, transportation and machinery use. Its corrosion-, high- and low-temperature resistance, and high-strength characteristics made the material as the top choice for industrial and manufacturing applications. However, manufacturing steel can be a complicated process. The demand for this component requires steel manufacturers to produce it in high quantities. Since this material contains different metal alloys, accuracy in data input is extremely necessary. Seamless information input and navigation reduce the processing time for steel production. Therefore, there is a need for a reliable peripheral equipment for industrial applications. By integrating industrial keyboards in a ruggedised computing system, it can help streamline a steel operation whilst providing an ergonomically-designed structure for precise information digitization. 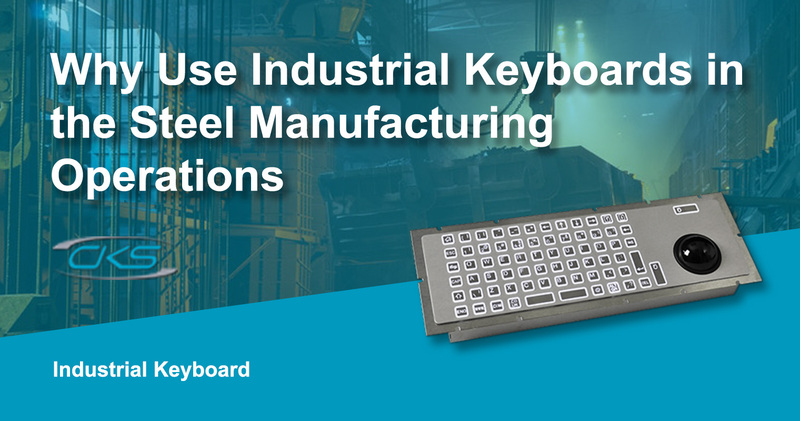 So, what makes an industrial keyboard advantageous in steel manufacturing facilities? Scroll down to understand the advantages and reasons to install this peripheral device in computing systems of steel production operations. The utilisation of a peripheral keyboard provided end-users with a convenient way to digitise information. For steel production, this ruggedised equipment is essential for automation and other critical computational functionalities. Ruggedised keyboards are built ergonomically so operators can comfortably put in the needed information which results in a reduction in input errors. Plus, its rugged components make it sturdy enough to last in the harsh environment of the production floor. This means that it minimises downtime of operations due to a failed hardware or peripheral equipment. What this entails for steel manufacturers is that operations are seamless and information input errors are reduced. As a result, there is an increased productivity whilst maintaining the quality. In the next section, learn why industrial keyboards are ideal for computing system integration. Integrating industrial keyboards in computing systems provide many advantages in improving and optimising steel production. In a busy and demanding work environment such as steel production, equipment with commercial-grade components will easily break down. Hence, the structure of an industrial-grade keyboard has high IP/NEMA protection rating. It ensures that the electrical parts are protected from damaging conditions. It allows uninterrupted data input and other computational functions which improves productivity. Since industrial-grade keyboards have sealed mechanical keys, these peripherals can last under the pressure of manufacturing applications. Operators will be able to use the equipment over extended periods. This means that it optimises overall operations due to being able to produce more in less time. The default key operations of a rugged keyboard can be modified. Specific commands can be assigned to keyboard shortcuts for more efficiency in operations. So, it reduces unauthorised personnel access to operations since these commands are the only set up for recognised operators. With these advantages, this device makes it an ideal peripheral data input solution for ruggedised computing systems. Especially in steel production wherein errors can cause drastic issues, this reliable keyboard is the best bet. Steel manufacturers have employed different technologies in order to keep up with the global demand for steel. Thus, seamless navigation and efficient data input are necessary for steel production facilities. Industrial keyboards are amongst the most ideal peripheral devices to the industrial computing system. It can last in an extreme environment whilst providing seamless navigation and ergonomic function. Contact a trusted industrial equipment provider today for more information about industrial keyboards.